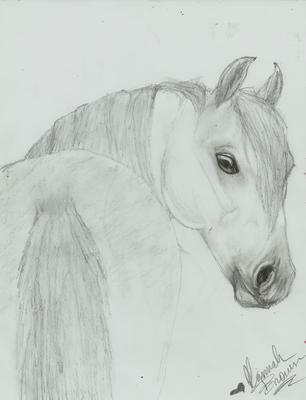 Andalusian, drawn in pencil. The muzzle isn't the best, but I like the look in the horse's eye. Comments? I tried to fix the muzzle, but it didn't exactly turn out. Your pic is awesome! I love it! I really agree with everyone! Your pic looks AMAZING! Keep up the awesome work! Could you please post more of your pictures? The muzzle looks better than what I could ever do! Keep up the good work and post more! So pretty! I so love it! Love it! It's beautiful! I love the eye it looks like he is all curious about something, Lol. Actually, I really liked the muzzle. It will enhance your picture when you're finished with your drawing, you go back and outline the major lines darker. Are you joking! The muzzle looks amazing girl! Wow! When I try to draw a horse it ends up looking like a monster! This is so good! 1,000/1,000!